An intimate wedding reception at The Courtyard at Lake Lucerne. Dennie and Basil was full of gorgeous details and beautiful blooms. Sarah created this design in just a few short months from meeting the lovely couple. They were married at St. James Cathedral with just a few friends and family. After the ceremony, they headed back to The Courtyard for dinner and dancing. The entire wedding party sat at a long head table with lush floral and candles. Each place setting was set with a small succulent favor with their name. Florida Sweets and Co created a gorgeous cake where Sarah added the finishing touches of fresh flowers and greenery. One of our favorite details of this reception was the fountain. 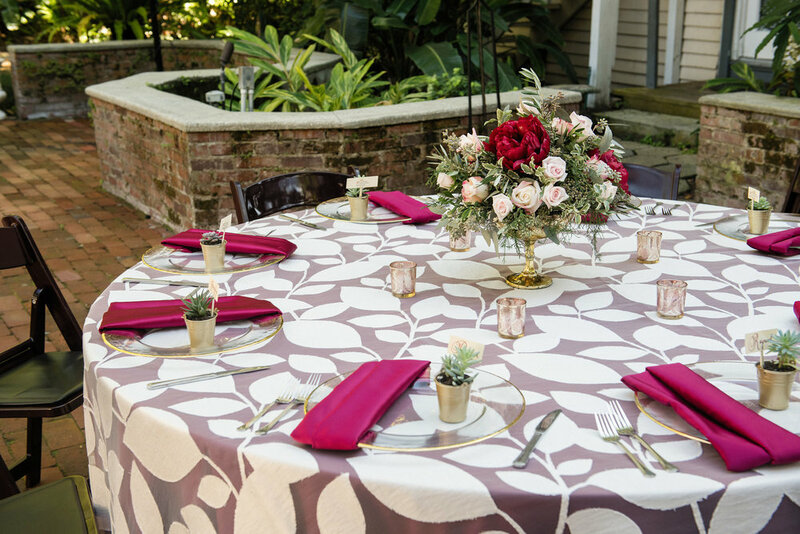 Already gorgeous without decor, adding floral to flow over the edge in jewel tones created the romantic, garden feel that Dennie and Basil were dreaming of.